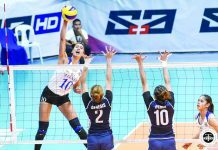 MANILA – Madeleine Madayag created a league record in blocks as Ateneo Lady Eagles cruised to a 19-25, 22-25, 27-25, 25-22, 15-11 win over University of Santo Tomas Golden Tigresses in UAAP Season 81 women’s volleyball at San Juan Arena. 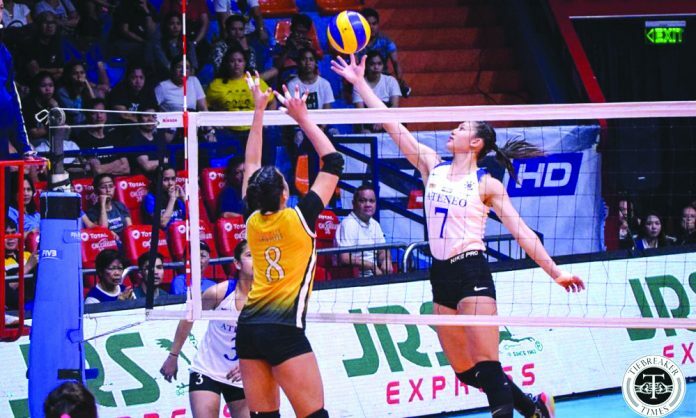 Madayag posted UAAP-record 11 blocks to go along with her 11 attacks and a service ace for 23 points to lead the way for the Lady Eagles, which remained on top with 7-1 win-loss slate. Kat Tolentino added 20 markers, while Isabel Beatriz de Leon and Pauline Gaston contributed 11 and 10 markers, respectively, for the Lady Eagles, which battled back from two sets down to beat the Golden Tigresses. Down 2-0 in sets, the Lady Eagles took a 12-8 lead in the third but the Golden Tigresses showed resiliency by forcing several deadlocks with last at 25-all before De Leon came up with back-to-back hits for Ateneo. UST jumped to a 17-12 lead in the fourth frame but the Ateneo slowly clawed its way back to tie the count at 20-all before unloading points from Tolentino and Madayag to force a fifth set. Both teams were into tight exchange in the fifth frame with the Golden Tigresses slightly up at 10-8 but the Lady Eagles came up with six straight points to reach the match point before taking the match on an UST error.